I love the story of Tsubasa and I love the character designs. Sakura Hime has so many different outfits it was so hard to choose the first one to cosplay! I decided on her Nihon kimono from the Shunraiki OVA. I love the simplicity of the design and the colours! It isn't a well known or often cosplayed outfit so I wanted to share some love for it. Kimono - I used McCall's M4953 kimono pattern as the base for Sakuras. Since her kimono is sleeveless I only took the body portion of the pattern and modified it to have the special curvature of the hem. 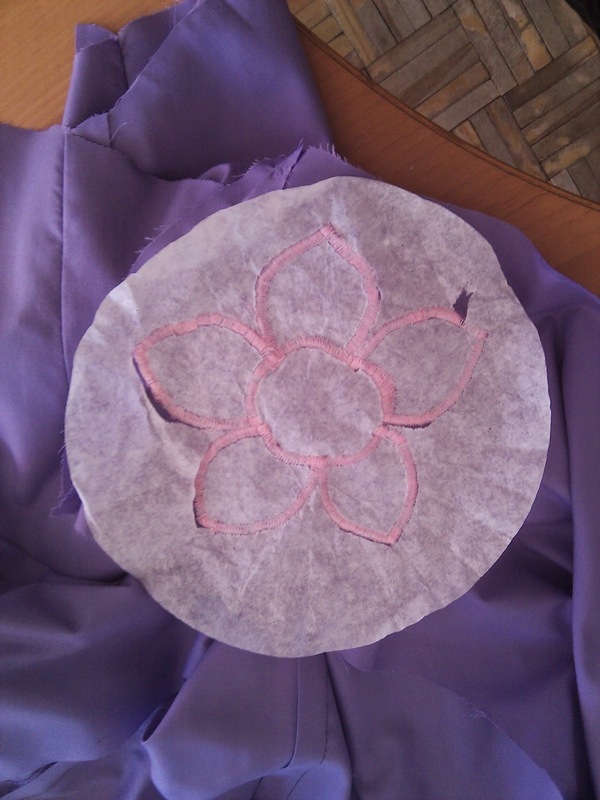 The appliques were added after the kimono was pieced together but before the lining was put together. They were made from a pink satin and were bonded to the fabric using Heat'n'Bond. I only later realized that you can't iron satin on the right side... Once the appliques were fused to the fabric, they were stitched in place using a satin stitch. I used a flattened out coffee filter as reinforcement for my stitches. I learned the hard way that the Heat'n'Bond glue sticks to the needle and this causes a lot of threads to break or the machine to skip stitches. I was recommended to used fusible interfacing next time). 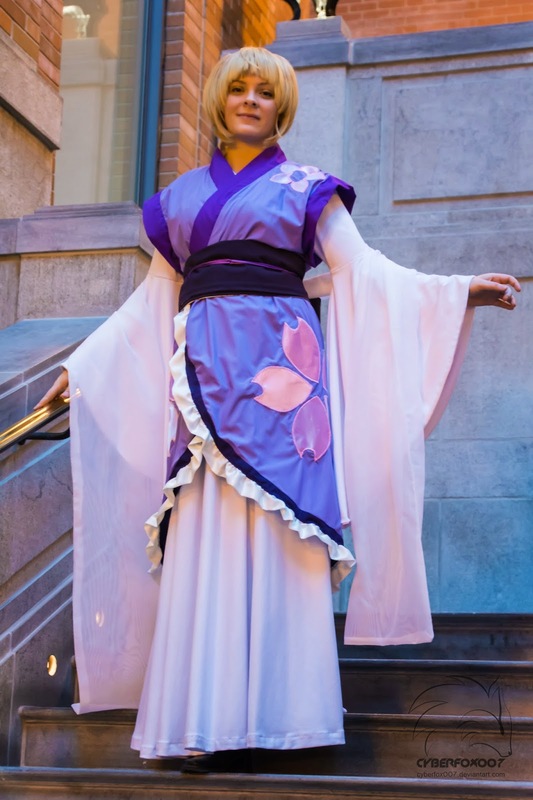 The kimono is completely lined and made out of a light purple fabric. 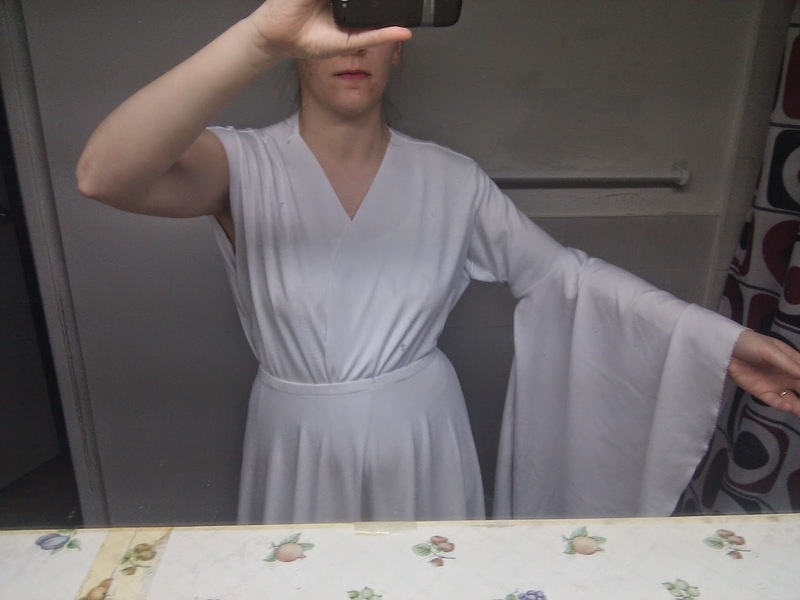 The fibers were unknown but I think they had a polyester base since that was the ironing temp that I ended up using :P The edging along the neckline and sleeves was made using a purple poplin fabric. 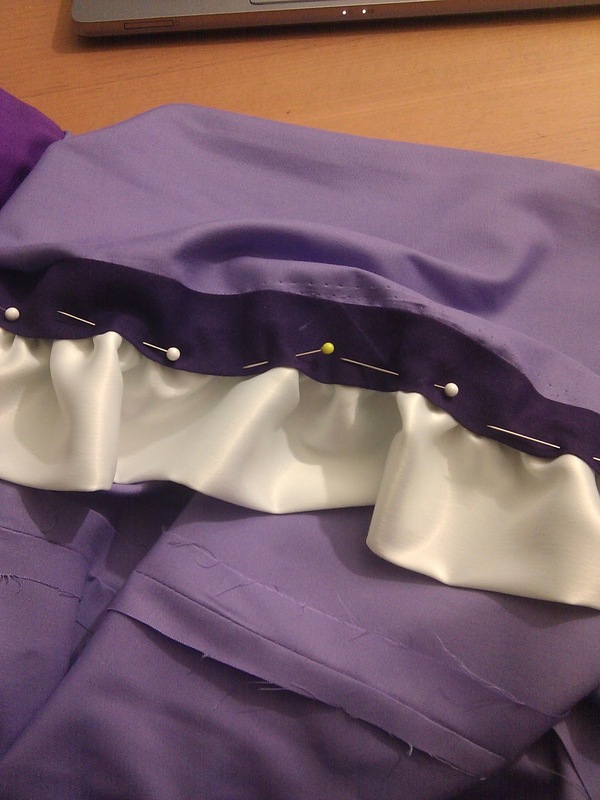 The ruffle was made using a white satin and it was attached to the hem via a dark purple single fold bias tape. To keep the kimono from moving around too much I take the white cord and tie it closed around my waist. I keep it in place under my obi. Obi - I wanted the obi for Sakura Hime to be an actual obit that I could tie and have a pretty bow in the back. 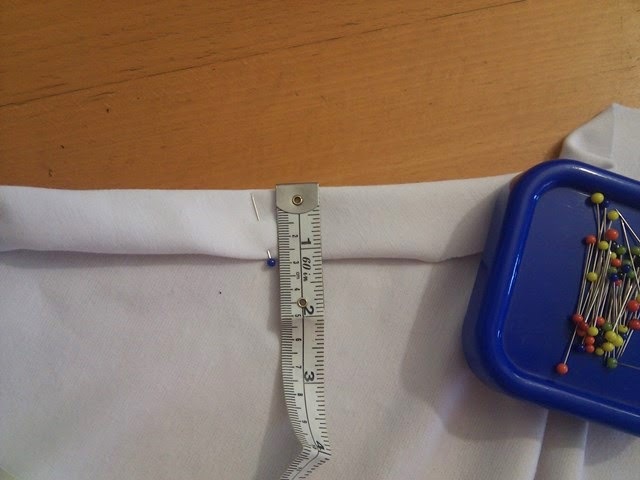 I used the measurements for a traditional Nagoya obi and tried to the best of my abilities to make it work when I only had one meter of fabric to work with. The obi is reinforced with interfacing and lined with a semi rigid cotton. The final product is slightly smaller than the traditional Nagoya obi should be and I personally feel that it isn't as stiff as it should be but it still works. I fold it in half along the length and then tie it in a bow. I pass a purple cord through the bow and tie it in front to keep it in place. Sash - The sash was made with a white, gauzy curtain material. It frayed really badly so I ended up having to fray check the entire thing! Since the sheer width of the cut was huge (I would say between 2.5 - 3 m) I didn't have to piece anything together. 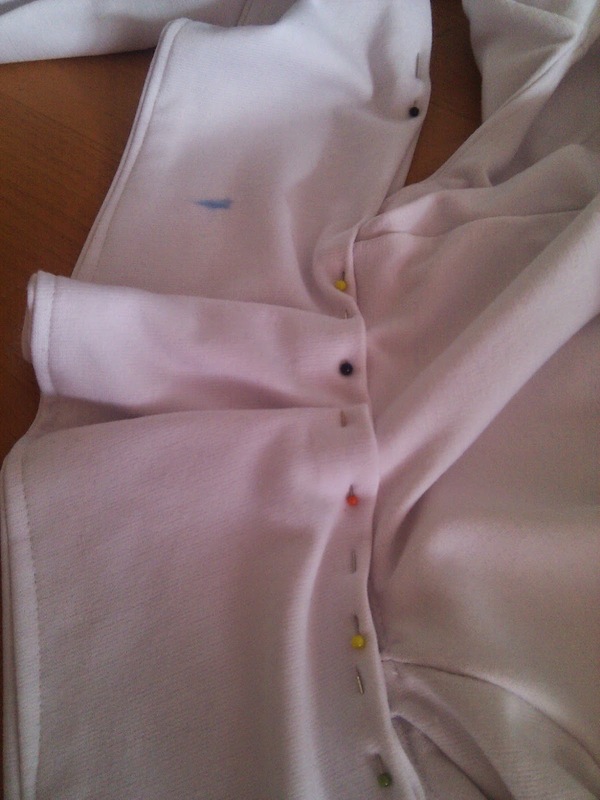 I just sewed it up along the sides and the top, leaving just enough room to turn it inside out. I was lazy and I just sewed it shut with my machine rather than slip stitching it :P The entire thing was pressed using the synthetic setting on my iron. 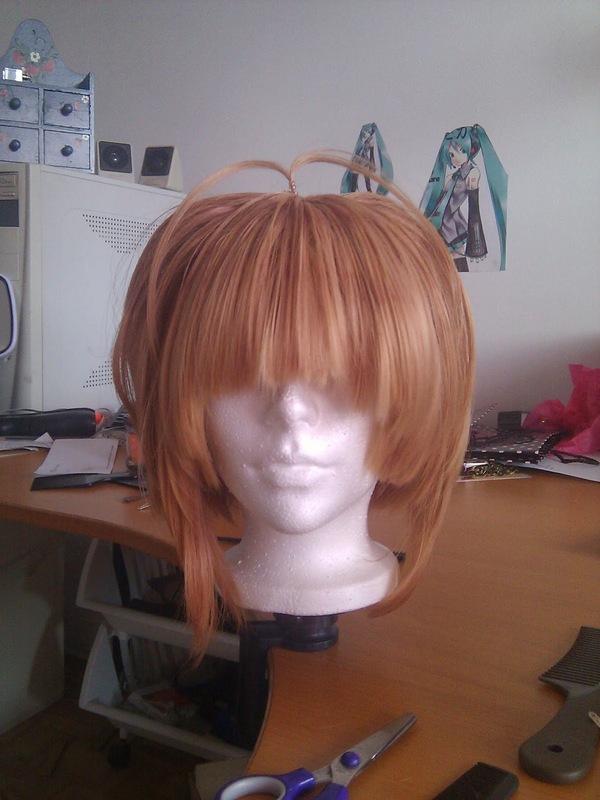 Wig - Instead of spending money and time on buying and styling a new wig, I just reused my Sakura Kinomoto wig from last summer. Actually it was my intention to use it again :) They are essentially the same character anyways so it works out.